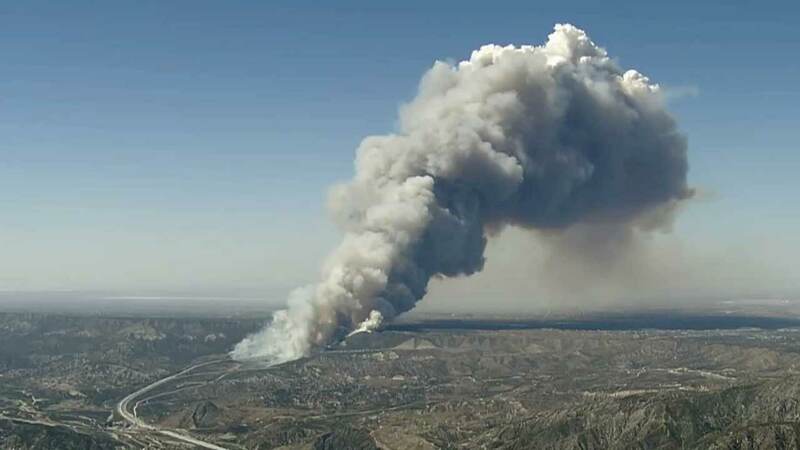 CAJON PASS -- A fast-moving brush fire in the Cajon Pass near the 15 Freeway stayed at 3,500 acres and was 60 percent contained by Sunday morning. About 700 structures were threatened and one person was injured. The U.S. Forest Service previously reported Saturday that the fire had grown to 5,454 acres, but later revised the number back down to 3,500. All lanes of the 15 Freeway between State Route 138 and Oak Hill Road in the Cajon Pass reopened after the fire shut it down Friday. Thunderstorms and heavy rain swept the area, which helped about 680 firefighters battling the blaze. By Saturday evening, the fire was 45 percent contained. On Friday, the brush fire quickly moved through the pass, charring more than 3,500 acres, burning structures and prompting evacuations. The fire broke out near the northbound lanes around 2:30 p.m., according to the U.S. Forest Service. The blaze moved quickly and ended up destroying 20 vehicles and damaging 10 others. About 50 to 75 cars were left abandoned on the freeway as firefighters rushed people off the road when the flames got too close. 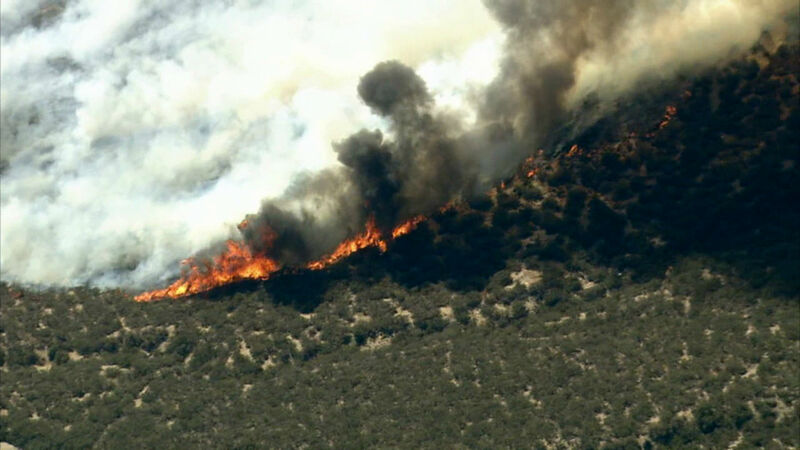 The fire reached Sage Street in the rural community of Baldy Mesa, causing mandatory evacuations of more than 7,000 people east of Sheep Creek Road, north of State Route 138, west of the 15 Freeway and Highway 395, and south of Phelan Road. At about 6:30 p.m. Saturday, residents were being allowed back in through Baldy Mesa and Phelan roads. Three homes, eight outbuildings and 44 cars were destroyed in the area, according to the U.S. Forest Service. Five drones halted firefighting efforts for about 25 minutes, and officials are asking people to keep drones away from brush fires. "As soon as we see drones, we shut down all of our aircraft for the safety reasons. Obviously, if a drone got sucked into a wing or a propeller, that could have some serious impacts," Lee Beyer, a spokesman for the U.S. Forest Service, told ABC News.